2 or up to 8 hours. 2.Position 2 oven racks to center and next lower positions; preheat oven to 475°. Place rimmed baking pan on center rack; preheat 10 minutes. 3.Add bell peppers and onion to reserved oil mixture and toss; spread on hot pan and roast 5 minutes. 4.Remove steaks from marinade; discard marinade. Push pepper-onion mixture to 1 side of pan; place steaks on opposite side. Wrap tortillas in aluminum foil. 5.Roast steaks and vegetables on center rack and tortillas on lower rack 5 minutes or until vegetables are tender and internal temperature of steaks reach 140° for medium-rare; let stand 5 minutes. (Internal temperature will rise 5 to 10° upon standing.) 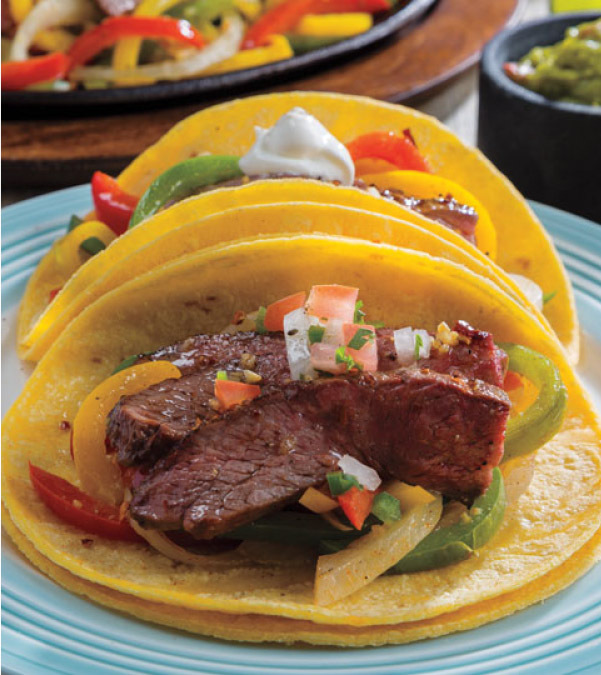 Serve steaks and pepper-onion mixture with tortillas and toppings, if desired.